There are a lot of things to miss about the Pacific Northwest–the old growth forests and fairy-tale moss, misty foggy air that seems to carry the weight of native history, the mountains and clear lakes and streams, the majestic Puget Sound. But most of all, I miss the abundance of foraged food everywhere you turn. Whether in the forest or the city, you could get salmonberries by the Burke-Gilman trail or golden plums in the public parks or even better, mushrooms! 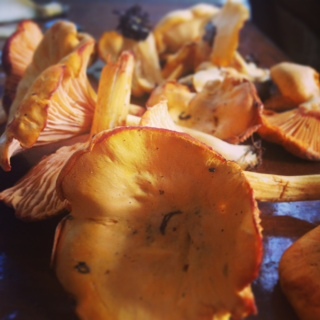 During a year of plenty, we had oyster mushrooms, shaggy parasols, and lobster mushrooms. We’ve lived in the Southern Adirondack region now for over 6 months. We explored and hunted, but somehow missed morel season altogether. Then, alas! We recently stumbled upon some mushrooms! They’re not just any mushrooms–the most delicate, floral, treasures of the summer with the most beautiful name to match their essence: chanterelles! First encounter with the beauties this year.